He will be replaced by Eira Thomas, a founder and director of the company who will be assuming the role of CEO. In addition, Catherine McLeod Seltzer, also a Lucara co-founder, will be joining the Board of Directors. 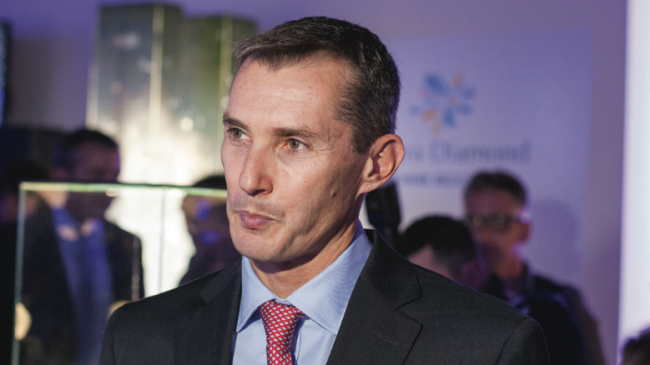 The miner said that under Lamb's leadership, the company's flagship Karowe mine has evolved into one of the world's highest margin diamond mines and the foremost producer of large, Type IIA diamonds in excess of 10.8 carats, including the historic 1,109 carat Lesedi La Rona (second largest gem diamond ever recovered) and the 813 carat Constellation (sold for a record $63.1 million). Lamb "galvanized Lucara's reputation as an innovator, championing its technologically advanced mine design to optimize revenues and minimize diamond losses through both autogenous milling and the use of X-ray transmission sorters to preserve large, high value stones and to create a simpler, more secure and efficient flowsheet. The Board would like to sincerely thank William for his many contributions during his tenure and is pleased to further announce that William has agreed to remain closely associated with the company in an ongoing role as a technical advisor." Thomas brings more than 25 years experience in the mining industry, including 16 years with Aber Diamond Corporation (now Dominion Diamond), where she served in ever increasing roles from initial discovery as a geologist to Vice President Exploration and ultimately a Director of the Board. She was co-founder of Stornoway Diamond Corp., serving first as CEO and then as Executive Chairman. There she led the acquisition of the Renard diamond deposit which subsequently became Quebec's first diamond mine. In 2007, she founded Lucara with partners Lukas Lundin and Catherine McLeod Seltzer. Eira most recently served as CEO of Kaminak Gold Corporation which was acquired by Goldcorp in 2016 for $520 Million. Eira is also a Director of Suncor Energy. In separate news, Lucara announced the acquisition of Clara Diamond Solutions Corp., "a company whose primary asset is a secure, digital sales platform that will transform how rough diamonds are sold, unlocking value for diamond producers and manufacturers alike". Clara uses proprietary analytics together with cloud and blockchain technologies to modernize the existing diamond supply chain, driving efficiencies and ensuring diamond provenance from mine to finger. Lucara will purchase Clara for a total up-front consideration of 13.1 million shares of Lucara (approximately $29 million in up-front consideration based on the closing price of Lucara common shares as at February 22) resulting in approximately 3.7% dilution to its existing share capital.